The Farm 2 School program has been rapidly expanding during 2013. Fun Food of the Month cafeteria tastings were held at all 16 Oshkosh elementary schools, sampling fresh, healthy, foods for K-5 students. re:TH!NK partnered with Fox Valley Technical College’s Culinary Arts Program and local restaurants to host chef events at 2 middle schools in Oshkosh. Students were able to see how to prepare healthy recipes and to try some new foods. Our Farm 2 School AmeriCorps member also provides classroom nutrition education in several public and private school systems in the county. Over 500 students at 8 schools received lessons from October through December. 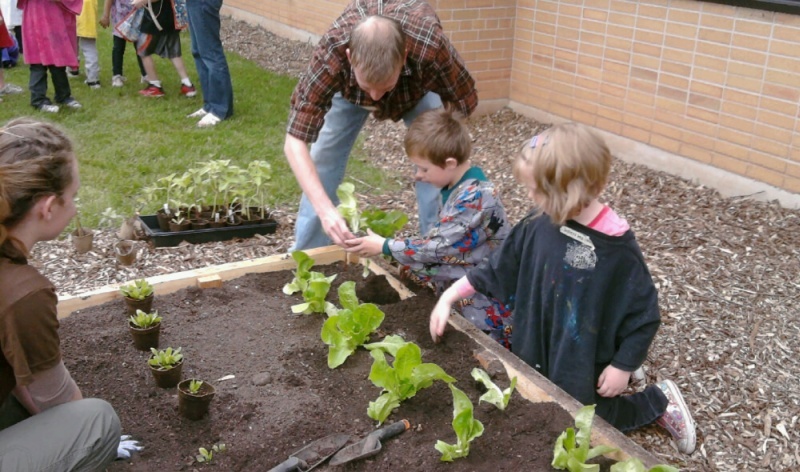 School gardens were built in two Oshkosh elementary schools during 2013, giving over 600 students the opportunity to get their hands in the soil and learn about growing vegetables. re:TH!NK staff working on Farm to School and the food service staff from Omro, Winneconne, and Oshkosh schools teamed up in August 2014 to prepare and freeze over 1,250 lbs of Ratatouille sauce to add freshness and vitality to the school lunch menus. Locally grown tomatoes, squash, eggplant, peppers, onions, garlic, and fresh herbs from Wisconsin farms were used to make the sauce. Over 12,000 students had the opportunity to try the ratatouille in their school lunches on pizza or as a side dish.